Who’s ‘Outside The Box’ With Me? I don’t do these kinds of things too often… personality quizzes aren’t really my game, but for some reason I did this one. And I’m writing about it because I was semi-interested in the end result… its assessment of “the type of person I am”. Yep, it says I’m “Outside the Box”. I guess there is no truer result than that for how I would actually define myself. For that reason, I give two thumbs up to Quizilla! 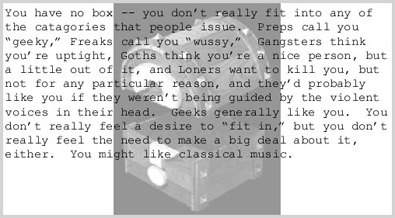 I first became intrigued by this site because it attempts to describe the kinds of labels people get assigned to, and the types of “boxes” people get put into. I decided to take the challenge and see which “box” I am generally put in — based on my personality and opinions on a few basic topics. In reality, I’m interested in this topic to a far greater degree than this simple quiz allows for. Jim and I have actually had this discussion several times, mostly after our pastor did a whole series of messages about “living beyond the labels that are placed on you” and how to break through the stereotypes. I mentioned to Jim that I didn’t really feel like I was an especially “labeled” person. Anyway, since that fateful day somewhere back in 2003 when I started thinking about labels and boxes and such… I’ve prided myself on being one who tries to “think outside the box”. Not to call attention to myself or my actions, but rather to create action or change indirectly — simply by the act of thinking differently than others do about everyday things. Oh gosh, look at me… I’m on some “outside the box” soapbox now! I certainly did not intend to go here. I simply wanted to share this semi-interesting (albeit mildly cheesy) quiz with you. I like the fact that this online “box assigner” was unable to place me into a box. I didn’t fit the mold. I’m proud to be one of the uncharacteristic souls who cannot be classified by those intent on classifying and labeling and boxing up people into groups and types and stereotypes. So, here’s to all the independent thinkers out there. Here’s to all those who don’t fit the mold of “normalcy”… I’m proud to be one for which there is no box to contain me! Are you? More “think outside the box” fun stuff! Try to connect the dots using only 4 lines. Exactly what is “thinking outside the box”? Learn how to think outside the box.